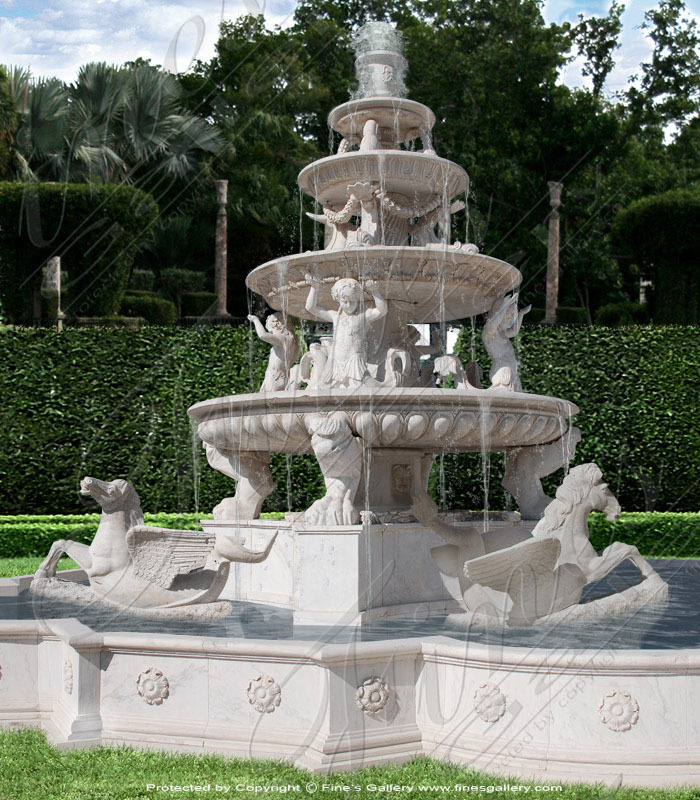 Superb craftsmanship is used to create this stunning fountain with extremely intricate details. 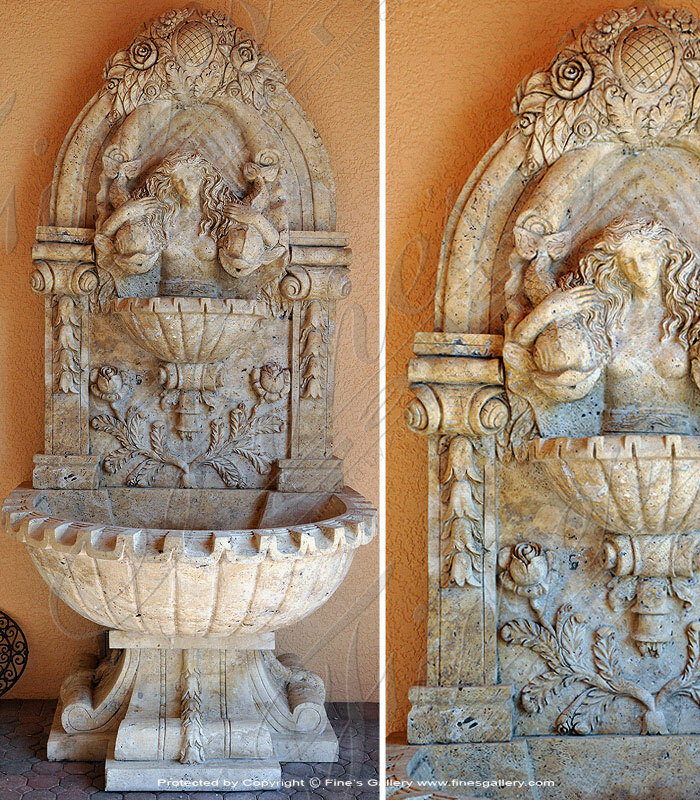 A beautiful maiden holds two fish as water pours from their open mouths into the stylish basin below. 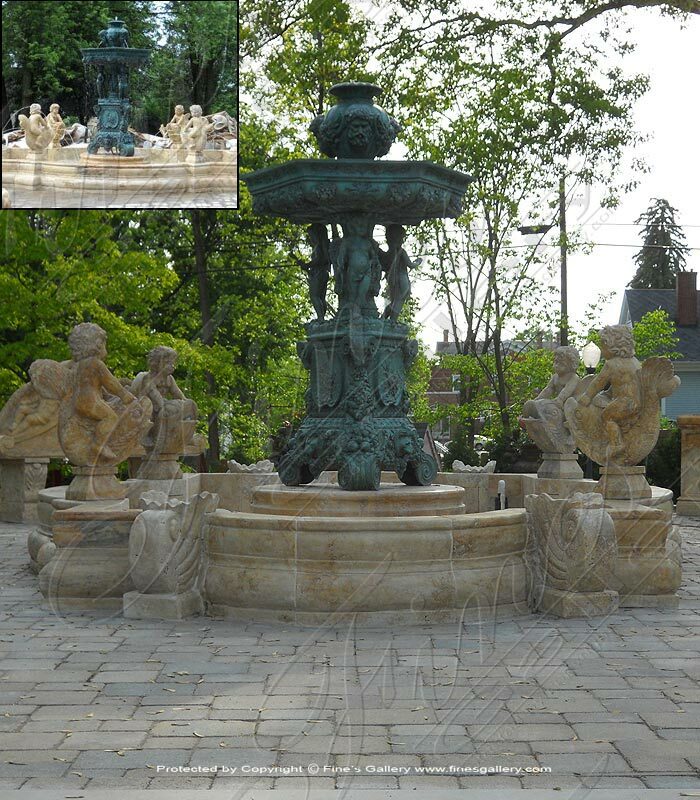 Choose from this lovely brown marble or any other color. 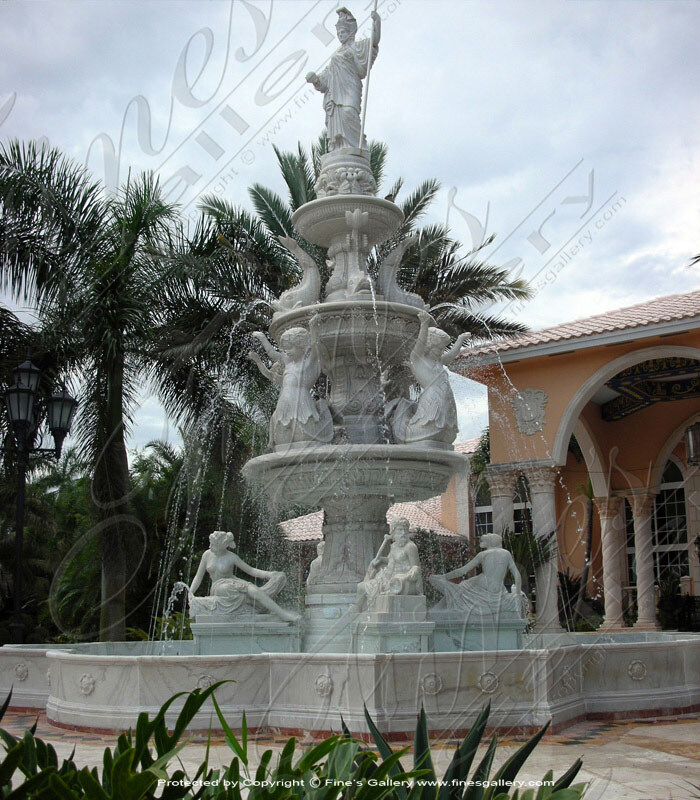 Dimensions: H: 123" W: 58" D: 40" View Colors Call Us! 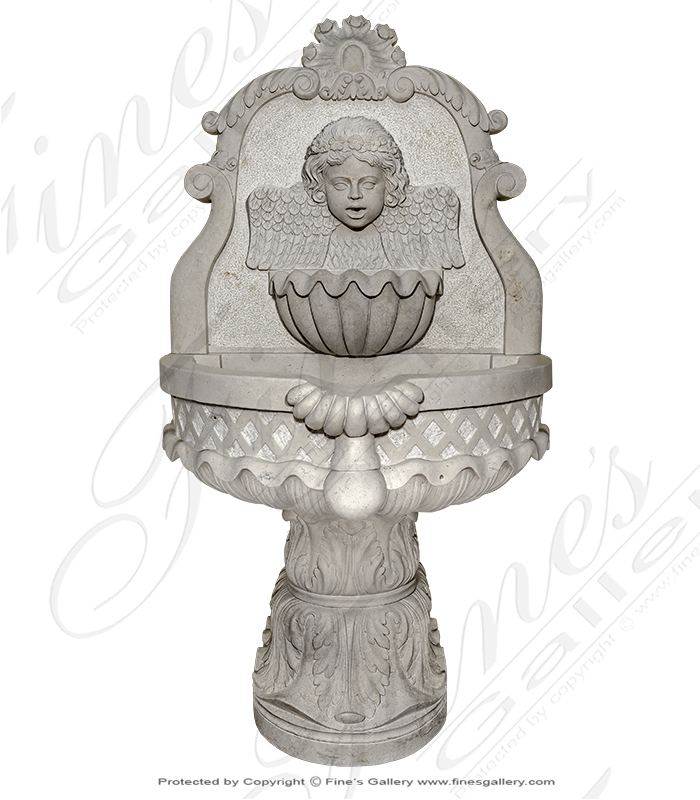 This is an incredibly ornate wall fountain featuring a lavish relief carving of birds, cherub, and meticulous floral decor. 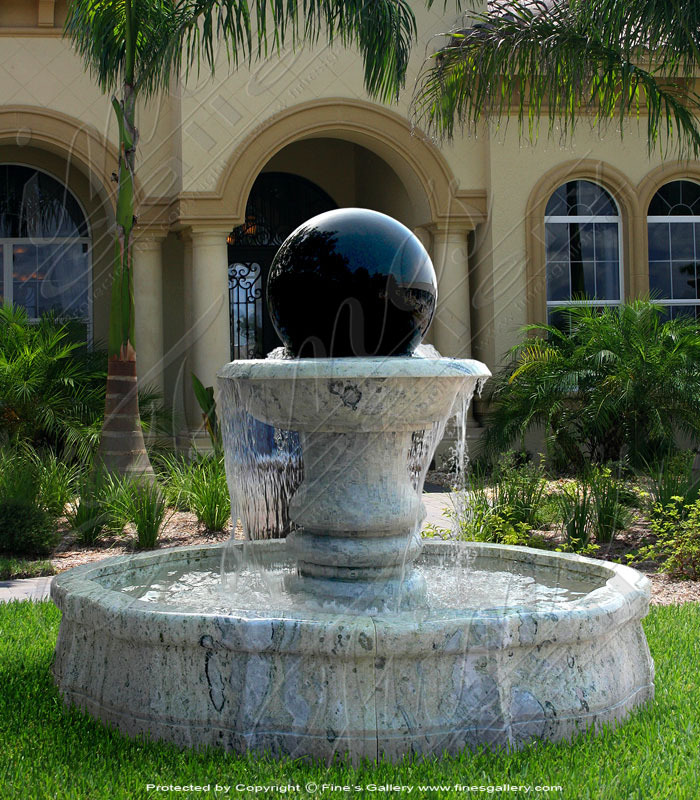 Water pours down into a large half moon bowl for a relaxing background sound in your yard or garden. Contact us today. Dimensions: H: 110" W: 66" D: 54" View Colors Call Us! 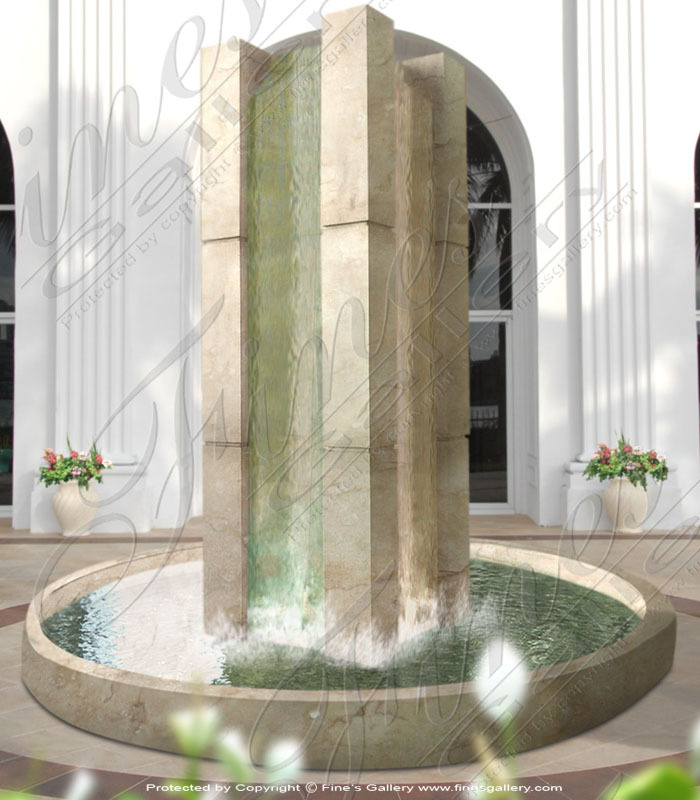 Dimensions: H: 119" W: 58" D: 25" View Colors Call Us! 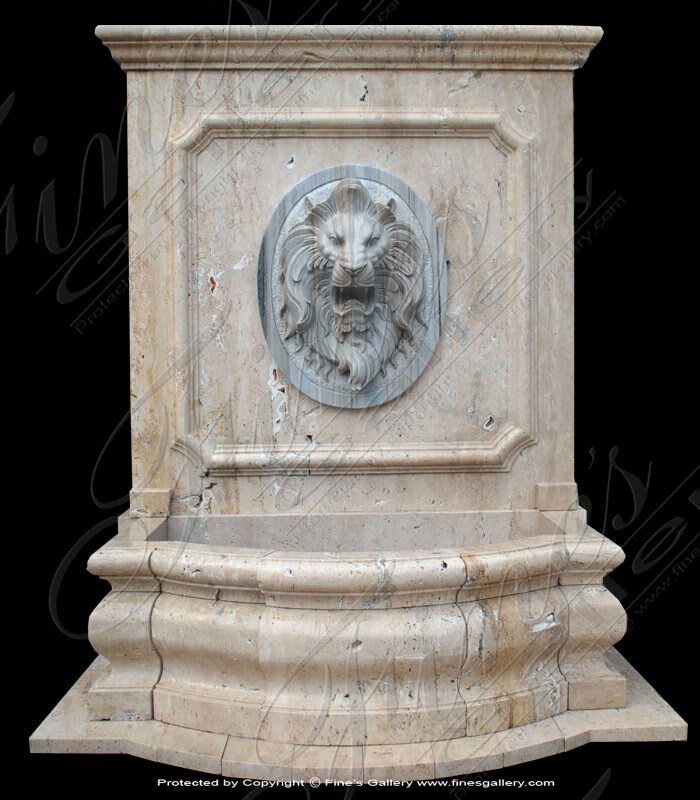 Dimensions: H: 64" W: 43" D: 23" View Colors Call Us! 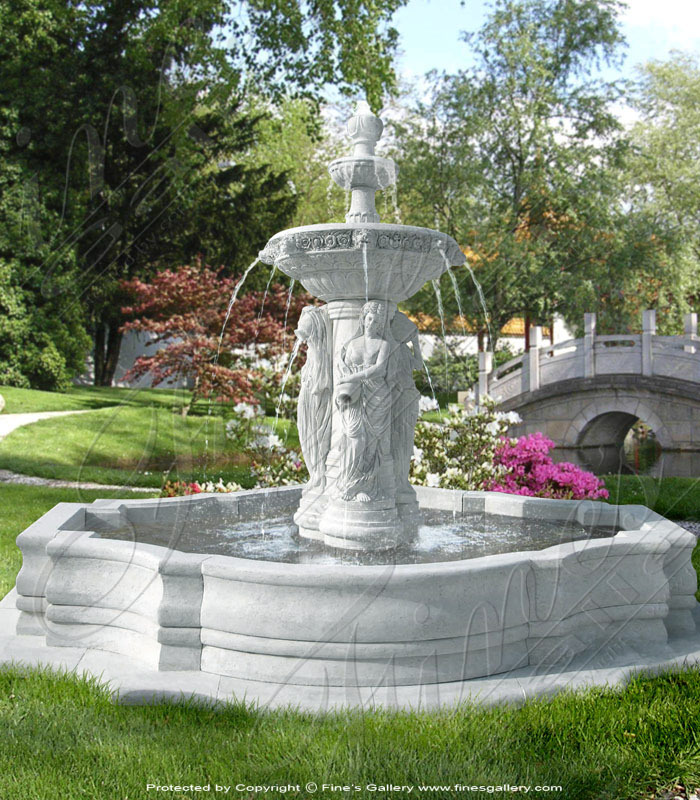 Large Outdoor Wall Fountain in Marble. 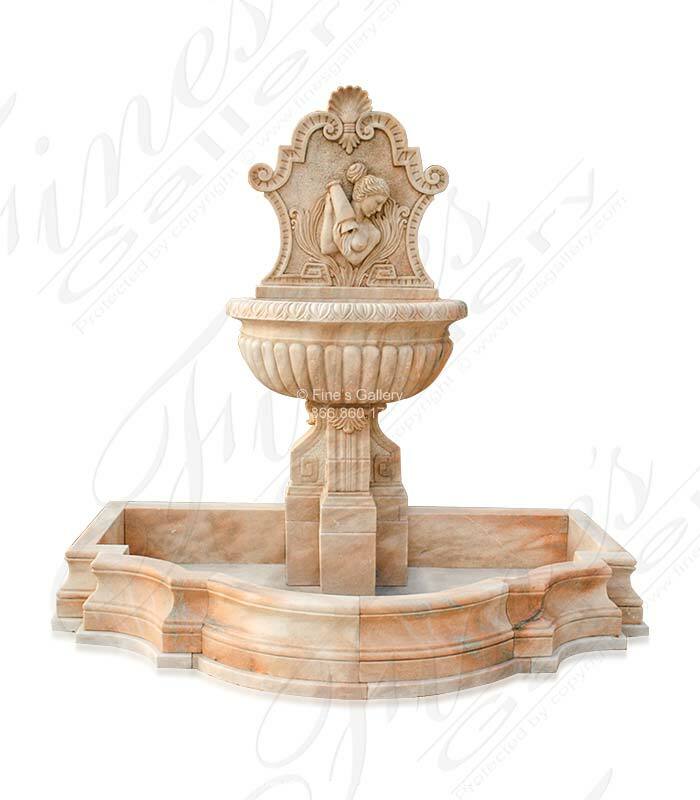 Decadent and meticulously detailed artwork adorns the frame of this elegant wall fountain made from beautiful light colored marble. Featuring a child face, flowers, and more within this design. Dimensions: H: 108" W: 70" D: 41" View Colors Call Us! 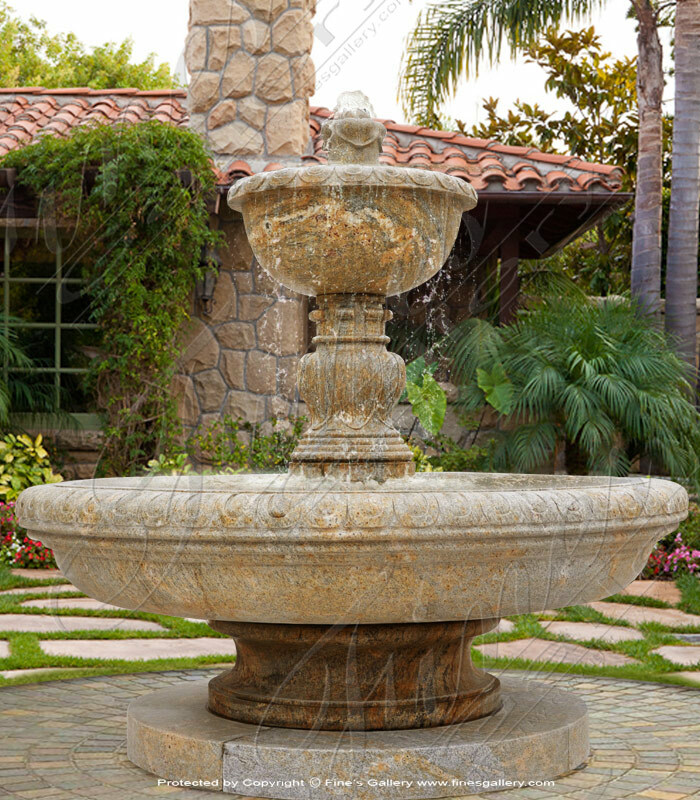 A lovely Grecian female empties her basin as water pours in waterfalls down to a heavy base pool. 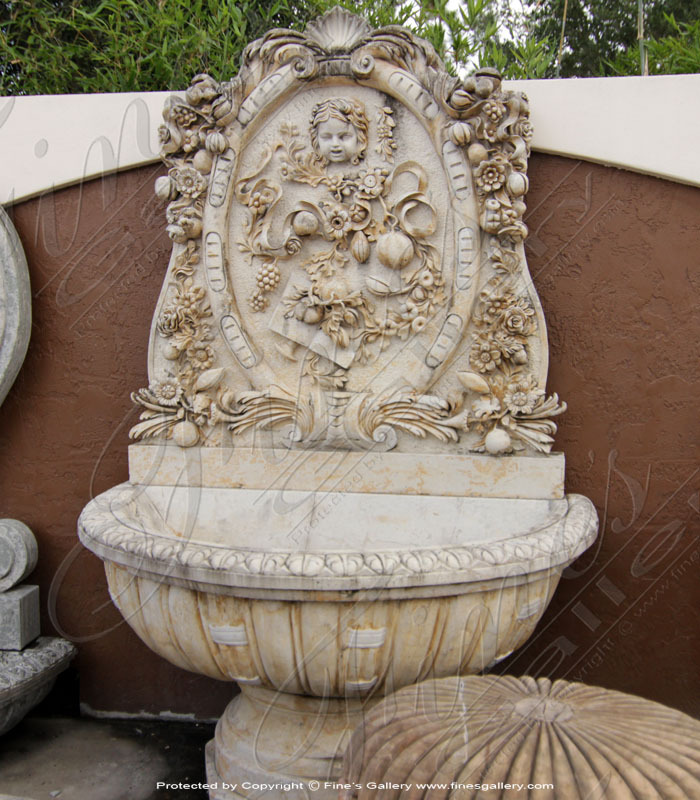 This enchanting design is meticulously hand carved in fine brown marble. A piece you will treasure and relax with for many summers. 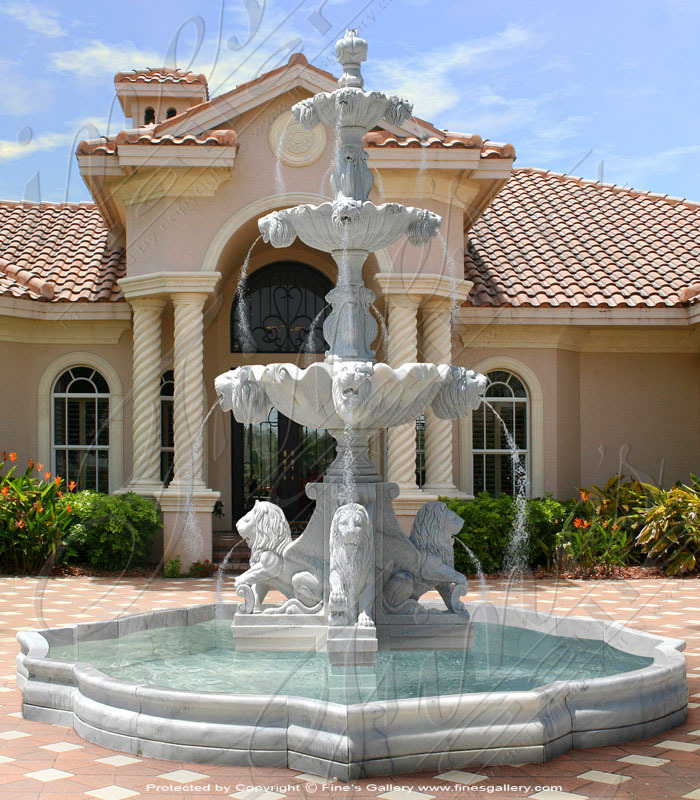 Dimensions: H: 87" W: 91" D: 58" View Colors Call Us! 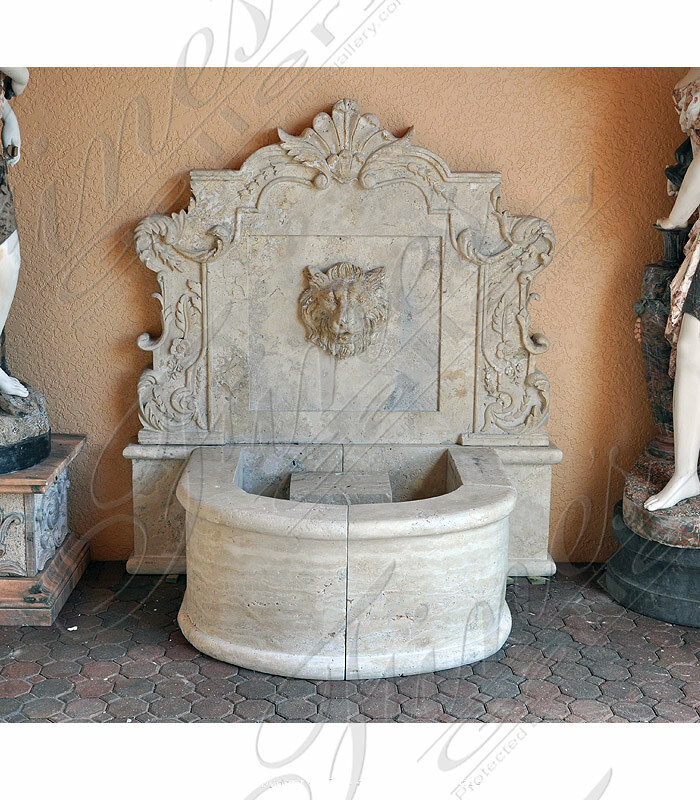 Dimensions: H: 84" W: 48" D: 22" View Colors Call Us! 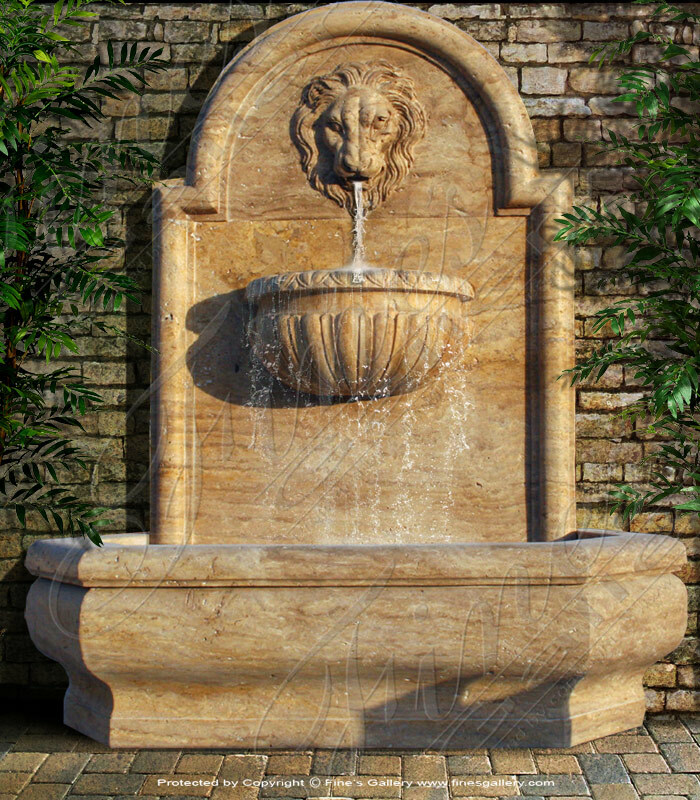 Majestic Flora Lionhead Marble Wall Fountain hand carved beauty and a whimsical design with plenty of flowers, scrolls, and a majestic lion head. A gentle stream of water provides a serene sound to this feast for the eyes. Carved from pure marble. 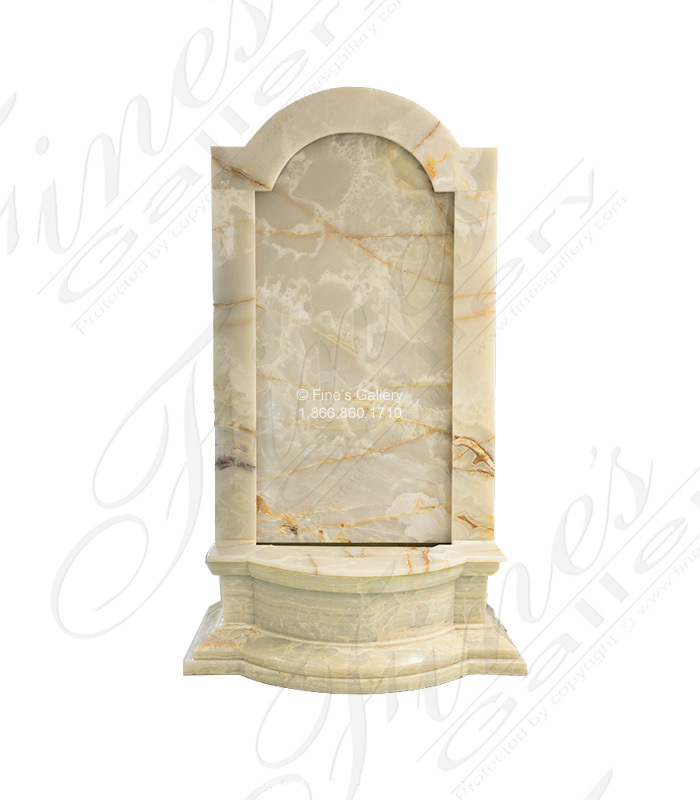 Dimensions: H: 92" W: 48" D: 34" View Colors Call Us! 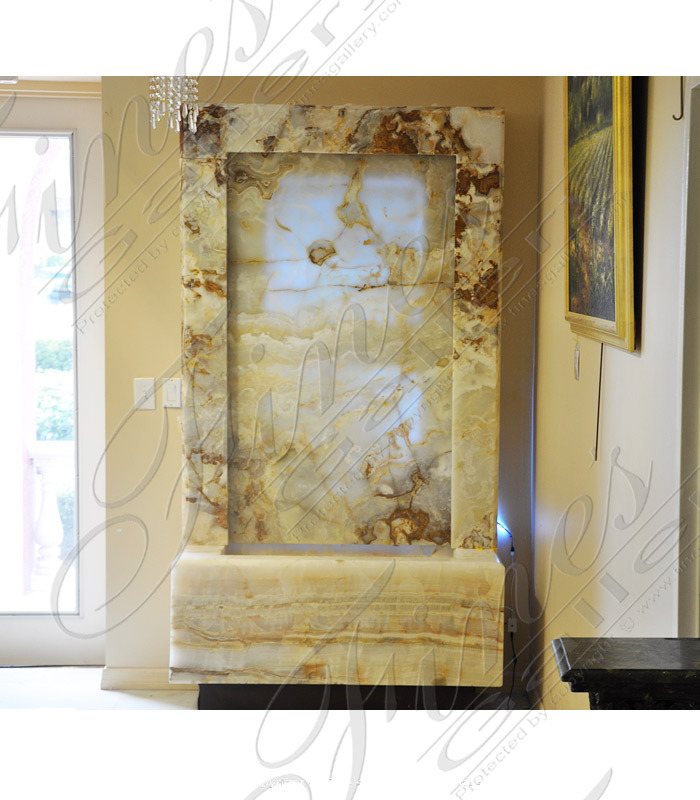 Dimensions: H: 96" W: 71" D: 43.5" View Colors Call Us! Dimensions: H: 81" W: 70.75" D: 35.75" View Colors Call Us! 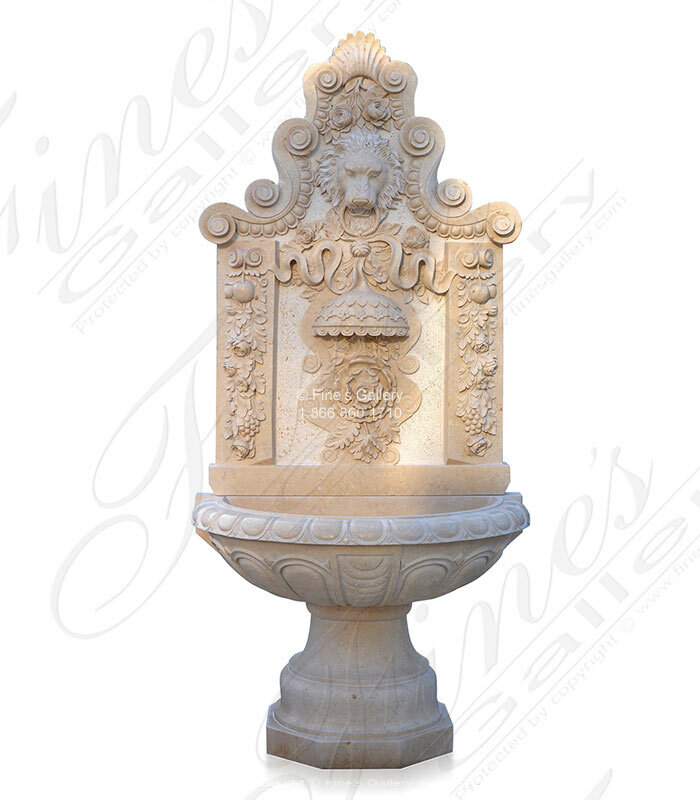 An amazing white onyx wall fountain. Translucent slab is back lit for amazing lighting effect while waterfall creates a soothing sound. 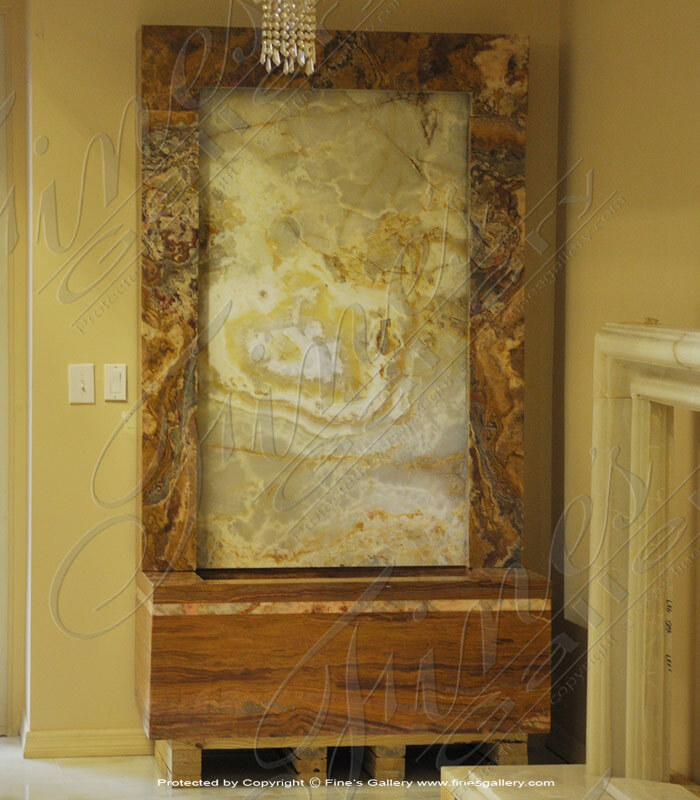 Dimensions: H: 72" W: 41" D: 22" View Colors Call Us! 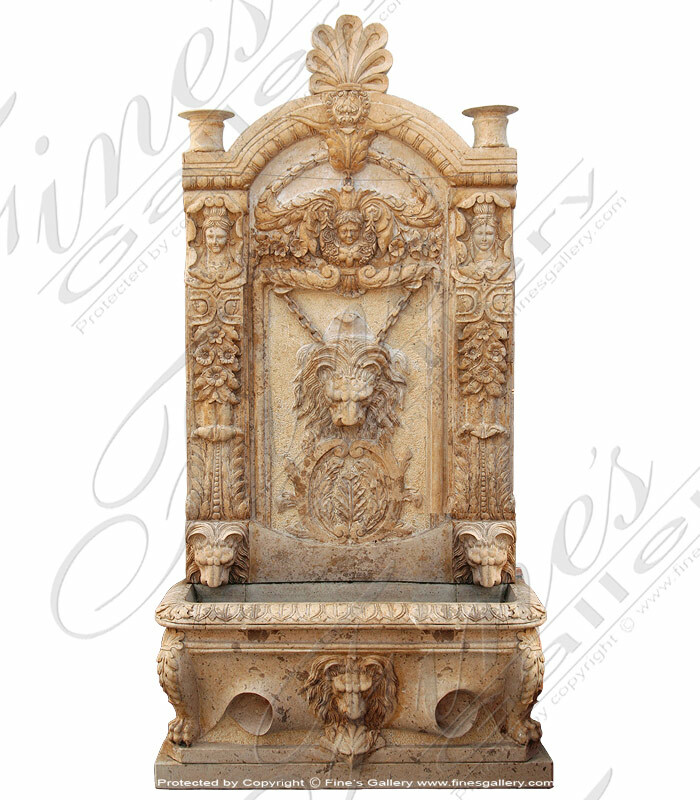 Dimensions: H: 108" W: 48" D: 22" View Colors Call Us! 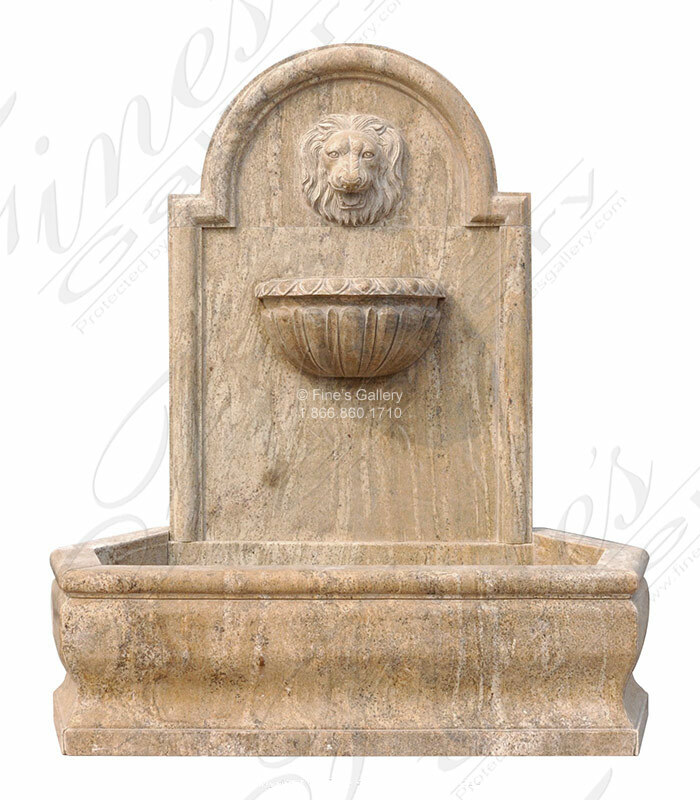 polished travertine lion head wall fountain. 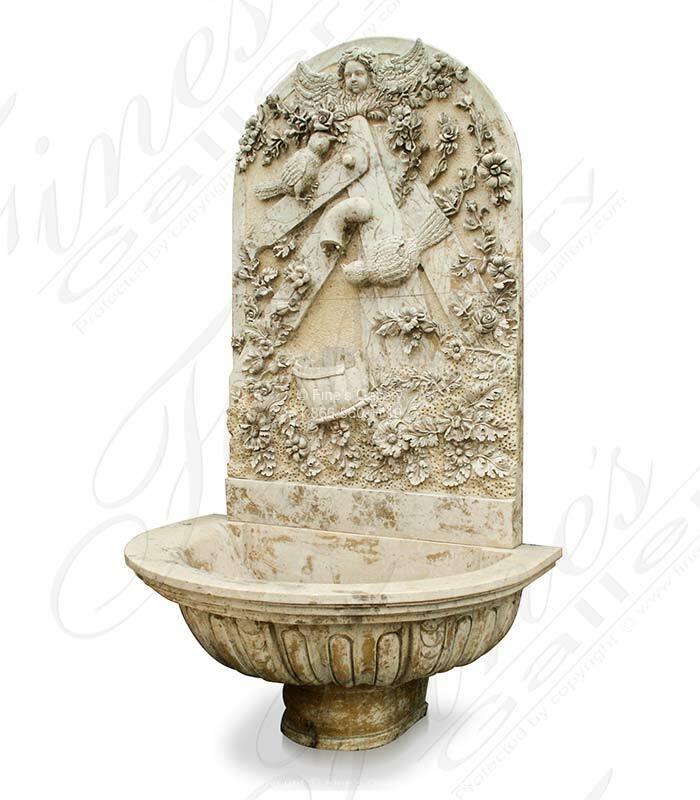 The flowers will be in bloom year round with this exquisite wall fountain. 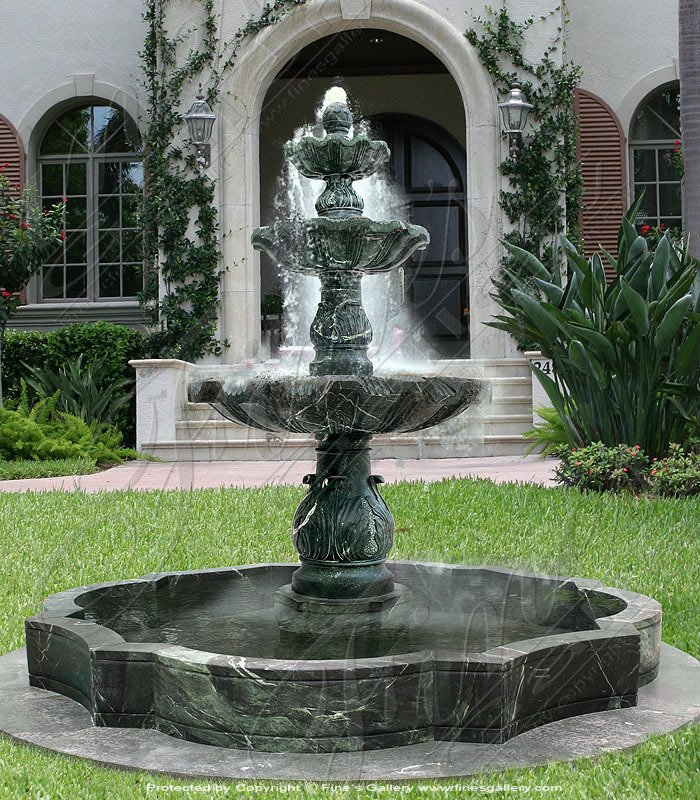 Carved in green marble, this charming fountain will beautifully accent your yard or garden, truly a wonderful addition to any collection. 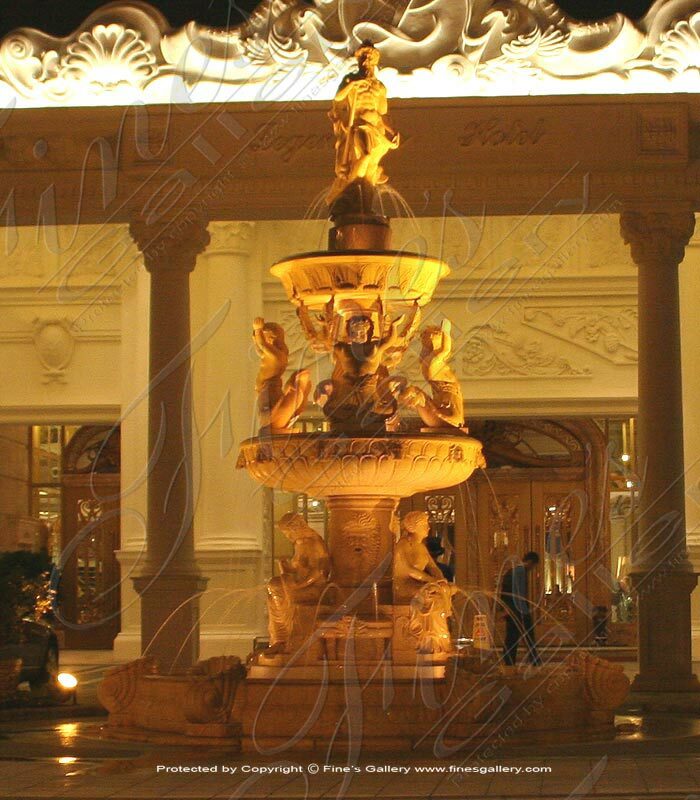 Dimensions: H: 86" W: 52" D: 32" View Colors Call Us! Dimensions: H: 68" W: 63" D: 40" View Colors Call Us! 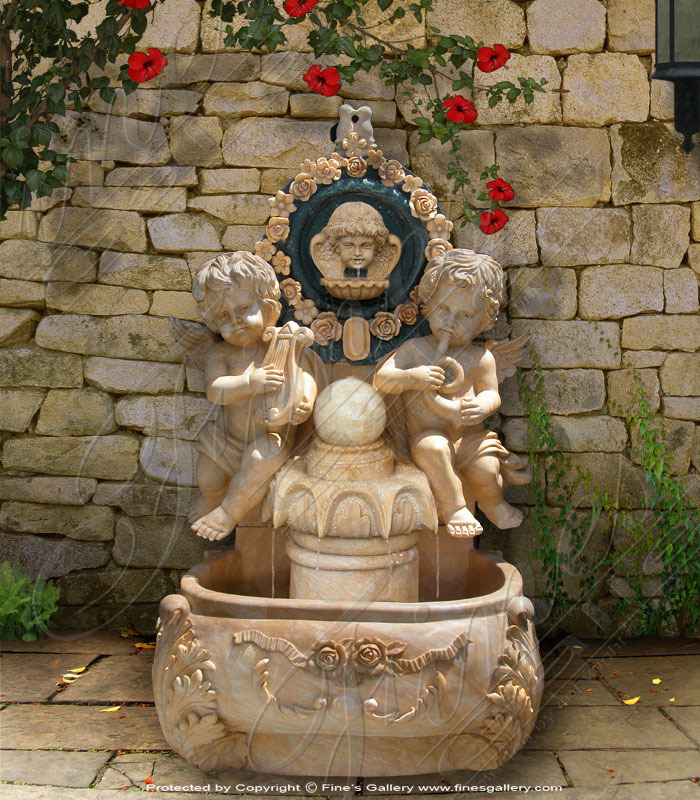 Two adorable cupids share the spirit of love and musical ambitions in this breathtaking marble fountain. 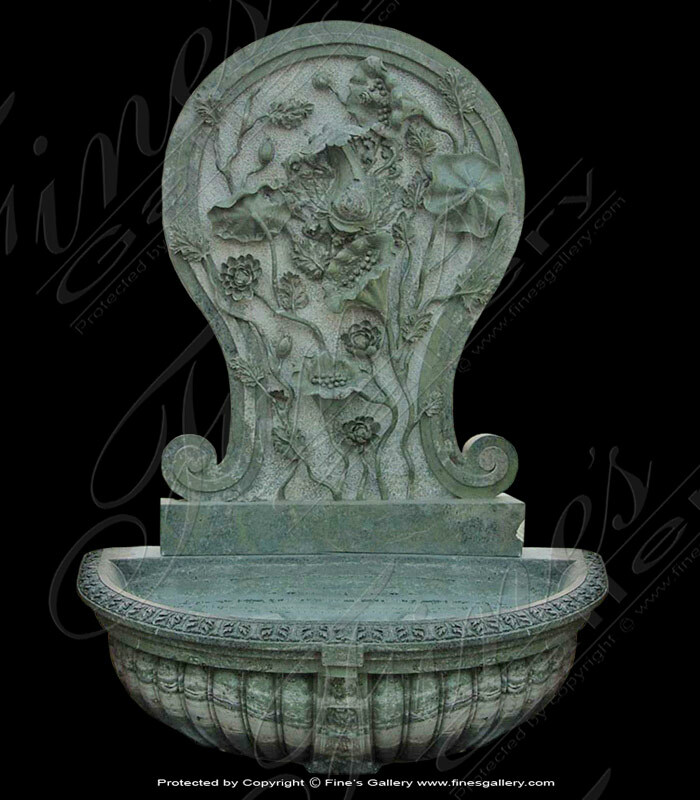 A beautiful floral design is masterfully hand carved into this delicate marble with subtle earth tones. Call us with all your questions. 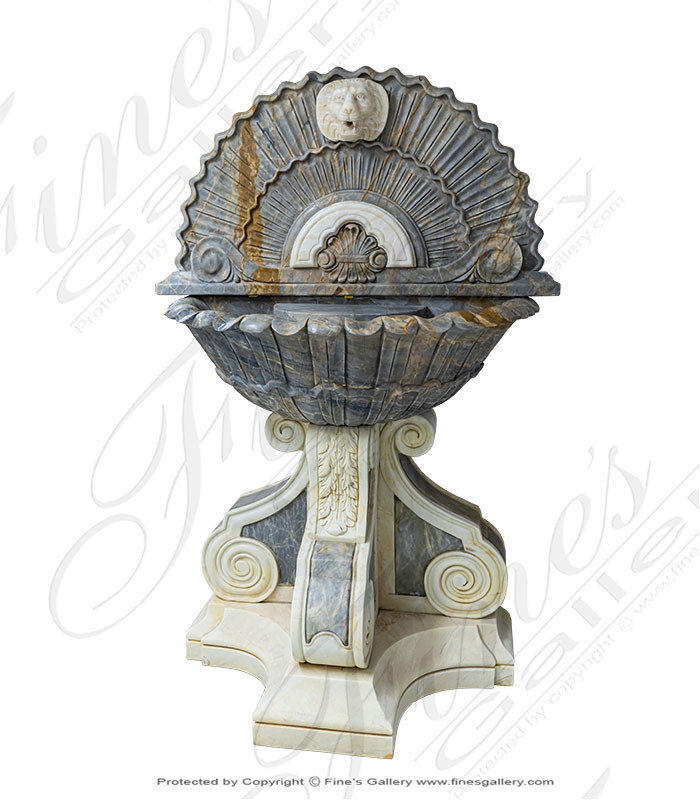 Dimensions: H: 52" W: 31.5" D: 25" View Colors Call Us!